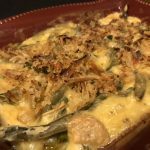 Most of the green bean casserole recipes are not Keto-friendly, but this one is adapted to align with the Keto diet using Keto-friendly ingredients. Instead of processed soups and packaged crispy onions, this recipe uses the perfect alternative. Cook diced onions in fry pan (in coconut oil) until translucent. Add cooking wine into pan, then add cream cheese. Stir together until blended and creamy. Then stir in cheddar cheese and stir until blended. Then add chicken broth and stir together. Last, stir in part of pork rinds. 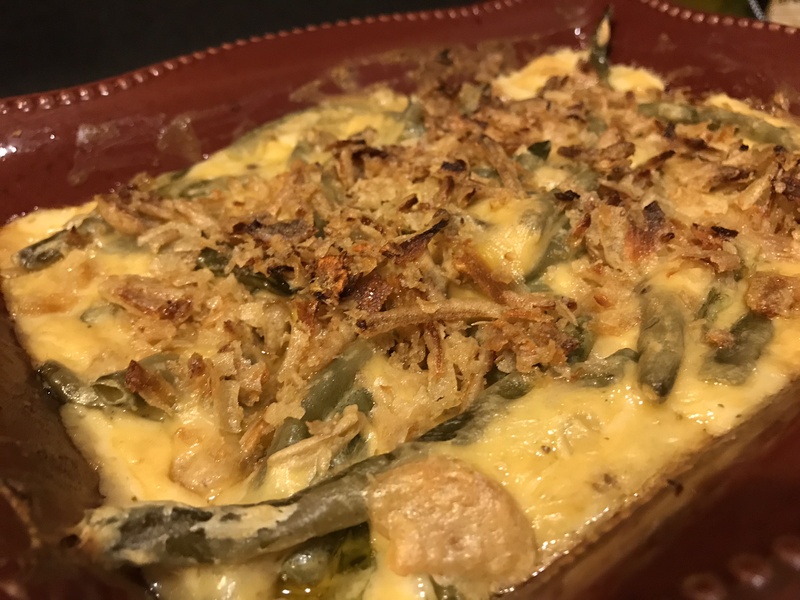 In a baking dish, add cooked green beans. Then pour in the creamy sauce and stir together to mix together. Top with crunched pork rinds.